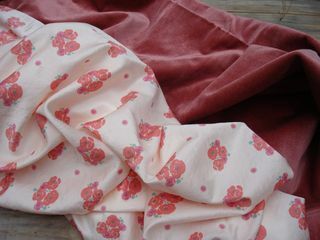 Does the least little hint of spring weather make you start daydreaming about sewing pretty cotton dresses? It sure turns my mind that way. I think I’ve spent all my spare seconds for the past week mentally matching up pretty fabrics with dress patterns I’ve spotted. Like MelissaMelissa’s roses with this Vintage Vogue dress. Or StephanieA’s Prairie Flowers as this classic shirtwaist dress. I spent the weekend carefully picking apart and tracing a 1940’s era rayon dress that had seen much better days so that I could recreate it in a Spoonflower fabric. Maybe in DanielleB’s white Summer Floral, or Demigoutte’s Ditsy Kites, or Monda’s Itsy Bitsy Ditsy (4). Did I say daydreaming? Perhaps it’s a bit of an obsession. Sadly, this obsession of mine has not so far translated into awesome garment fitting skills. Yet. But I’m working on it! In fact, I just found out that one of my very favorite retro dress sewists, Gretchen Hirsch from Gertie’s Blog for Better Sewing, is offering a class on Craftsy on sewing the perfect bombshell dress. Woo-hoo! Care to join me in a little dress obsessing? This week, we’re giving away a chance to win admission into this online class or, if dress-making is not your thing, into any other quilting or sewing class on Craftsy. Craftsy classes are taught by people who really know their stuff and best of all, the class never expires. You can take it whenever you want and as often as you want! To enter this drawing, just leave your comment on this blog post or the corresponding Facebook post. Include your Spoonflower screen name so we can track you down easily, and let us know which class you’re interested in. Good luck and happy pre-spring sewing, y’all! Last week’s winner of the 6-month subscription to WhimseyBox was Berene Campbell of HappySewLucky, and I know she’ll make good use of it. Congratulations, Berene! On my coziness agenda this weekend: figuring out tasty ways to use up the roughly 30 pounds of apples that Stephen and the kids and I recently picked at a farm in Western N.C. Apple butter is definitely on my list, and apple-printed fabric jar toppers would dress them up nicely for gift-giving, I think. Happy fall weekend, Northern Hemisphere peeps–I hope all of you out there have coziness agendas of your own that you're working on! Anyone else working on a cool weather project this weekend? It's suddenly chilly here in NC! Creating a beautiful frame to hang on your wall — or place in your office window — using Spoonflower fabric is an easy and inexpensive decorating idea that costs less than $15. 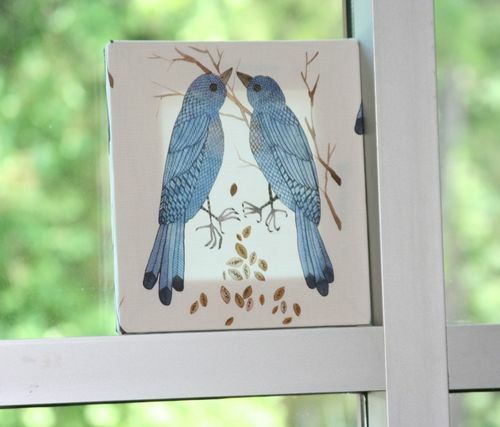 A fabric frame also makes an affordable and original gift! Quilting-weight cotton works fine for canvas stretcher frames, but for a more sturdy fabric that holds slightly denser color from the inks you might choose linen-cotton (see available fabrics). We used Gollybard's fabric for the frame pictured above, but Spoonflower is full of unique fabrics that would work just as well! 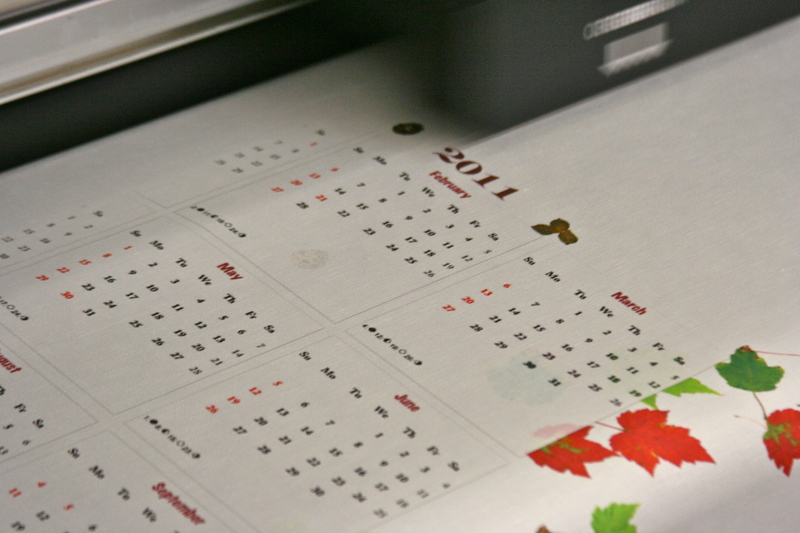 2011 Tea-Towel Calendar Template… so you can design your own tea-towel calendar! 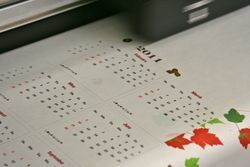 For those of you wondering how to make your own 2011 tea towel calendars to print on Spoonflower, below is a calendar template to get you started. We're a bit late posting this, given that our 2-for-1 tea towel sale ends tomorrow (Friday, Dec. 3), but better late than never. There's still almost a month to go before the New Year starts. If you download the Word version, you can edit the fonts and colors as you wish, then save the file as a PDF that can be imported into a graphics program like Photoshop, or the much cheaper Pixelmator (for Macs only). If you're in a hurry, just download and import the PDF we've set up. Please note that, while I dearly love Google docs, importing the .doc file into Google docs will mangle the formatting. I haven't tried it, but it might survive the transition to OpenOffice, however. 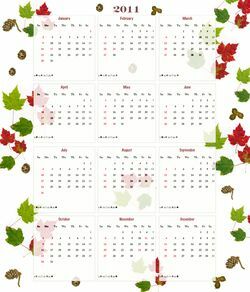 For our tea-towel calendar, Stephanie and I scanned some fall leaves on our office scanner, then I outlined them in Pixelmator and pasted the leaves around the edges of the PDF calendar layer I had imported. I also photographed, on a white paper background, a few pine cones, nuts and leaves. By playing with the brightness and contrast in the finished photo, I managed to get rid of any shadows in the background of the images. 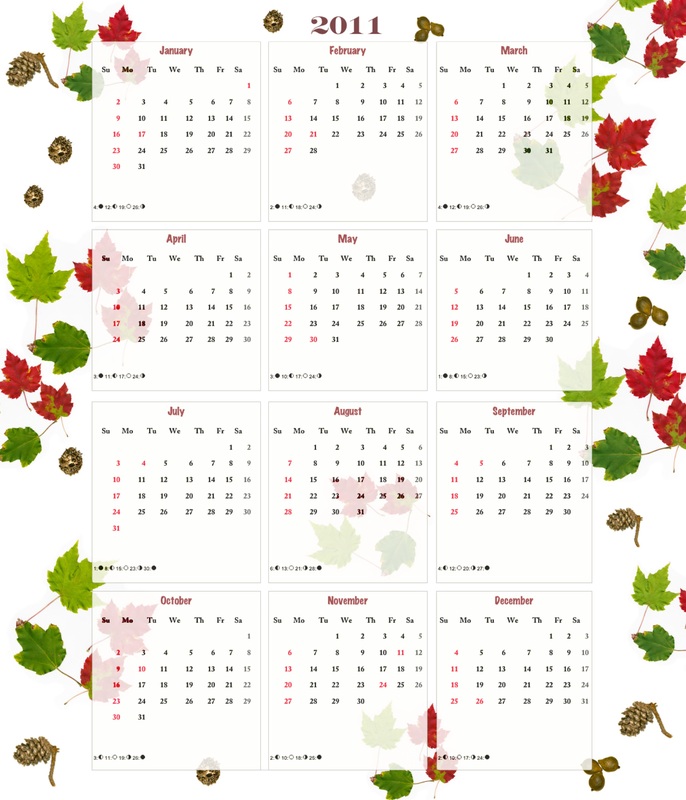 Then — just as with the leaves — I pasted the individual elements (as transparent PNGs) into new layers in the calendar file in Pixelmator. The resulting calendar is set up to fit on a fat-quarter of quilting weight cotton (21" x 18"), but I'm printing it on linen-cotton canvas, which will make a sturdier tea towel. <— Here it is coming off one of our printers! People who are not familiar with design tools like Photoshop and Illustrator often ask me how they can go about creating fabric designs to print using Spoonflower. There are many approaches you can take, of course, but just for fun I threw together this very short how-to video on making your own fabric design using a handful of colorful, fall leaves and a simple home office scanner. By way of Craft magazine, Threadbanger has this excellent video on how to make an easy shirred summer dress. If you’ve ever felt–like I did–that surely it couldn’t be as easy as it sounded to create shirring with elastic thread, view on! On video, it sure looks that way! 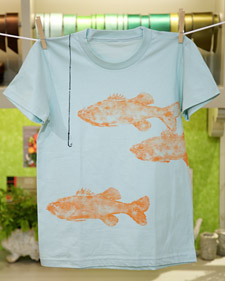 You could "generously ink" a fish in order to make a fish-printed garment like this one from Martha Stewart. Or you could save your fish for the grill and just Spoonflower! I'm just sayin'…. 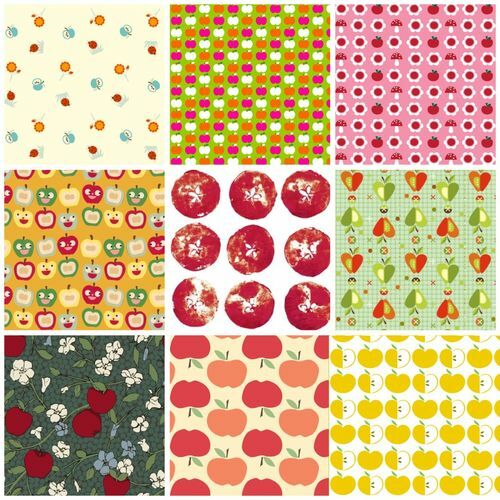 I seldom have time for cranking out the sewing projects these days with Spoonflower, young'uns, and gardening season taking up nearly every second of free time in my day. So it is with great relief–and perhaps a bit of surprise that it really is done–that I show you all my new Lollychops pear dress, finished at last! As Lolly herself well knows from the gushy email I sent her when I first laid eyes on her printed pears, I love this design and was delighted to be able to own some myself when it won the fabric-of-the-week contest a few weeks back. I've made a few little girl dresses from Spoonflower fabric, but these pears were for me! For the clothing sewers among you, this was made from New Look 6586, and my review of this pattern is here. Busy fabric-printing mamas sometimes get behind on their blog reading and blog posting, which is why I'm only just now finding a spare minute to post about Diane Gilleland's tutorial on mending a shirt with reverse appliqued scraps of fabric. The effect is so pretty on her polo pictured, and doesn't use much fabric at all. Perhaps you've got a lonely Spoonflower swatch and a garment in need of some patchy love lying around? Diane's tutorial was part of Craft magazine's March Mending Month which–ahem–I confess that I learned about far too late because of aforementioned fabric-printing madness around here lately. There's still one more day of March left though, right? Right? Sigh. We'll be caught up and current around here again one of these days, I just know it! Speaking of things being current–or not–many of you no doubt noticed that the fabric of the week contest announcement was mysteriously absent last week. I'll save the official announcement of the winning design for Stephen, himself a very busy fabric-printing papa. But we had a whole lot of votes and, I think, a whole lot of excitement about last week's contenders. I hope you're all as excited about the week's winner as I am!